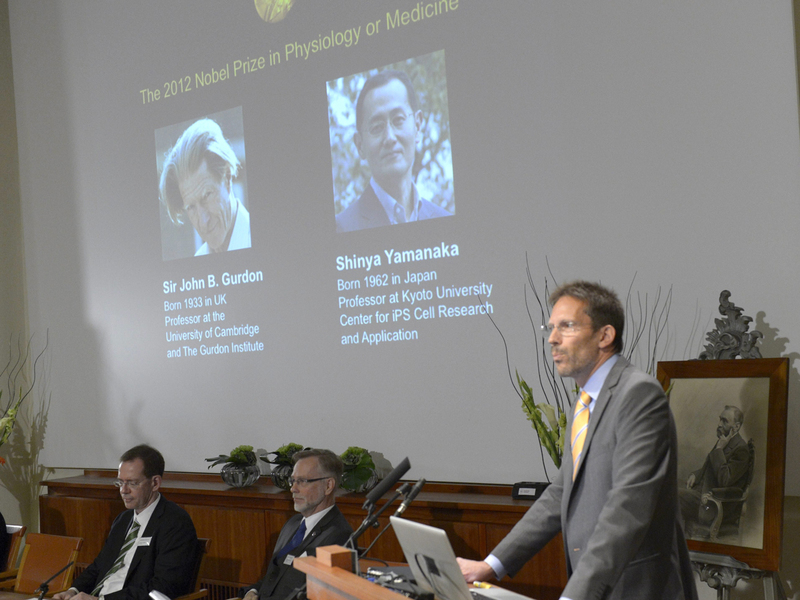 STOCKHOLM British researcher John Gurdon and Shinya Yamanaka of Japan won this year's Nobel Prize in medicine on Monday for discovering that mature, specialized cells of the body can be reprogrammed into stem cells  a discovery that scientists hope to turn into new treatments. Scientists want to harness the reprogramming to create replacement tissues for treating diseases like Parkinson's and for studying the roots of diseases in the laboratory. The prize committee at Stockholm's Karonlinska institute said the discovery has "revolutionized our understanding of how cells and organisms develop." Gurdon showed in 1962 that the DNA from specialized cells of frogs, like skin or intestinal cells, could be used to generate new tadpoles. That showed the DNA still had its ability to drive the formation of all cells of the body. More than 40 years later, in 2006, Yamanaka showed that a surprisingly simple recipe could turn mature cells back into primitive cells, which in turn could be prodded into different kinds of mature cells. Basically, the primitive cells were the equivalent of embryonic stem cells, which had been embroiled in controversy because to get human embryonic cells, human embryos had to be destroyed. Yamanaka's method provided a way to get such primitive cells without destroying embryos. "The discoveries of Gurdon and Yamanaka have shown that specialized cells can turn back the developmental clock under certain circumstances," the committee said. "These discoveries have also provided new tools for scientists around the world and led to remarkable progress in many areas of medicine." Gurdon, 79, has served as a professor of cell biology at Cambridge University's Magdalene College and is currently at the Gurdon Institute in Cambridge, which he founded. Yamanaka, born in 1962, worked at the Gladstone Institute in San Francisco and Nara Institute of Science and Technology in Japan. Goran Hansson, the secretary of the prize committee, says he had reached both winners before the announcement. "I spoke to both laureates on the phone and they're equally happy and that they look forward to coming to Stockholm." The medicine award was the first Nobel Prize to be announced this year. The physics award will be announced Tuesday, followed by chemistry on Wednesday, literature on Thursday and the Nobel Peace Prize on Friday. The economics prize, which was not among the original awards, but was established by the Swedish central bank in 1968, will be announced on Oct. 15. All prizes will be handed out on Dec. 10, the anniversary of prize founder Alfred Nobel's death in 1896. Last year's medicine award to Canadian-born Ralph Steinman, American Bruce Beutler and French scientist Jules Hoffmann briefly created some confusion when it was announced that Steinman had died a few days earlier. Posthumous prizes are normally not allowed, but the award was left unchanged since the judges were not aware of Steinman's death when they selected him as a winner.